Which are the best mutual funds for 2019? Where I should invest my money in 2019 to get more returns? Well, I am sure that you must be excited to know the answers to these questions. It is an extremely difficult task to get answers to these questions. However, by doing a research and following correct selection method one can easily find good mutual funds for investment. The year 2018 was an average year for the stock market as well as for mutual funds. Last three months were difficult for the stock market. It was bear market and most of the mutual funds have given negative returns. It is expected that the bear market will be short lived and year 2019 will be the year of bullishness. 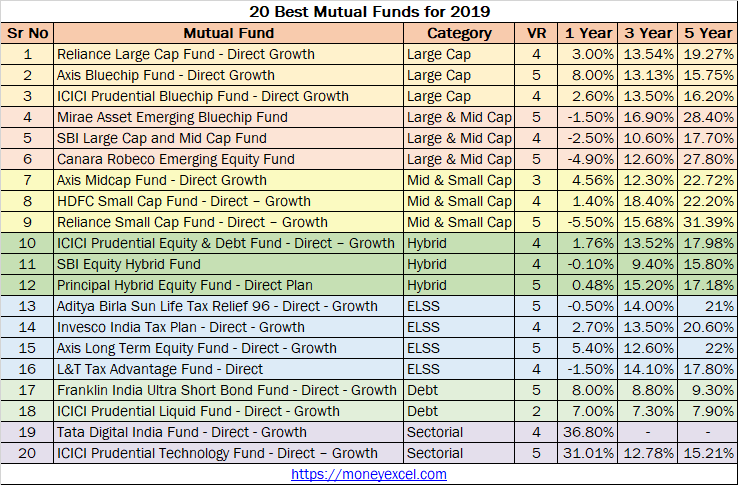 To grab new investment opportunity of 2019, I have tried to filter out Top 20 Best Mutual Fund SIP for 2019. If you are planning to invest in a mutual fund for the long term you should consider these funds. Fund performance – The second factor used for shortlisting of a fund is the fund performance. I have selected best performing fund 3-5 years. Benchmark – I have taken into consideration the performance of the fund against a benchmark index. Fund Rating – The third thing is fund rating. Higher the fund rating better is fund. I have considered rating given by CRISIL and Value Research. The fund rating above 3 stars are considered. Holdings – Another factor for the shortlisting of Best Mutual fund is fundholding. Fundholding with good blue-chip stocks or making an investment in stocks which are likely to appreciate in future. Scheme and Asset Size – Scheme type and asset size is another important factor while selecting funds. All funds selected here are higher in asset size – 100 Cr or above. Based on the above parameters the Best Mutual Funds SIP to Invest for 2019 are given below. Reliance Large Cap Fund is the first large-cap mutual fund for 2019. It is four star rated fund. This fund has given a very good return in the past. The objective of this fund is to generate long-term capital appreciation by investing in large-cap companies. The expense ratio of this fund is very low. It is one of the recommended fund for investment. Axis Bluechip Fund is next best mutual fund in the large-cap category. This fund has given magnificent returns in the past and even given an aggressive performance with respect to the benchmark. The major holding of this fund is in finance and technology, which is likely to perform better. It is managed by an experienced fund manager. ICICI Prudential Bluechip Fund is one of the best mutual funds in the large-cap category. It is four star rated fund. The expense ratio of this fund is very low. It is managed by an experienced fund manager. The past performance of this fund is very good. Mirae Asset Emerging Bluechip Fund is five star rated fund in large & mid-cap category. The objective of this fund is to generate income and capital appreciation from a diversified portfolio of large cap and mid-cap stocks. The past performance of this fund is very good. The portfolio of this fund includes a good mix of large and mid-cap stocks. SBI Large Cap and Mid Cap Fund is next best fund in large-cap & mid-cap category. This fund has generated very good returns in the past. It is one of the oldest fund managed by an experienced fund manager. One can invest in this fund with long-term perspective. Canara Robeco Emerging Equity Fund is next in the list. It is five star rated fund with the objective to generate capital appreciation by diversified portfolio of a large and mid-cap fund. This fund has a very good fundholding. The expense ratio of this fund is slightly higher. 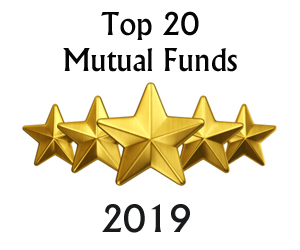 Axis Midcap Fund is first in the list of best mid & small-cap mutual funds for 2019. This fund has generated a very good return even in the bear market. It is managed by an experienced fund manager. The expense ratio of this fund is very low. HDFC Small Cap Fund – Direct – Growth is four star rated fund. This fund mainly invests their money in the small-cap company. YOY performance of this fund is very good. This fund selects small cap companies carefully. You can invest in this fund for a long-term perspective. Reliance Small Cap Fund is one of the best mutual funds in the small cap category. This fund has 90% of asset allocation in equity. This fund has very good performance track record. ICICI Prudential Equity & Debt Fund – Direct – Growth is the first best hybrid mutual fund for investment. This fund invests 60% of the money to equity with a minimum cap of 51%, 40-49% in the debt market with minimum cap of 20%. It is an aggressive hybrid fund with very good fund rating. This fund has given a very good performance in the past. SBI Equity Hybrid Fund is next in the list of best hybrid mutual funds. It is four star rated fund with a diversified portfolio of equity and fixed income instruments. This fund has given a very good performance in the past. The expense ratio of this fund is slightly higher. Principal Hybrid Equity Fund – Direct Plan is one of the best hybrid Mutual fund. It is five star rated fund. It is comparatively new fund, but it has generated very good returns in the past. The expense ratio of this fund is low. The first best-performing tax saving mutual fund is Aditya Birla Sun Life Tax Relief 96 – Direct – Growth Fund. The objective of this fund is to invest 80% of the assets in equity and remaining in debt and money market instruments. Aditya Birla Sun Life Tax Relief 96 – Direct fund has given very good returns to the investors. It is open-ended fund managed by an experienced fund manager. It is 3 star rated fund, investing money in mid-cap as well as large cap. The second best-performing tax saving mutual fund is Invesco India Tax Plan – Direct – Growth Fund. This fund intends to invest across market capitalization sectors utilizing bottom up approach. In last 3 years this fund has given very good return. This fund is performing well in both bull as well as bear market. It is slightly conservative tax saver fund. Next best performer in the list is Axis Long Term Equity Fund – Direct – Growth Fund. This scheme aims to generate long term capital growth by investing in companies with strong fundamentals. This fund has generated magnificent returns in last 5 years. It is four star rated fund with low expense ratio. It is very good mutual fund under ELSS for investment. L&T Tax Advantage Fund – Direct – Growth is next in the list of best-performing tax saving fund. This fund primarily invests in equity and equity-related securities. It is four star rated fund with low expense ratio. Franklin India Ultra Short Bond Fund as name indicates it is short term debt fund. The objective of this fund is to enhance income by investing in mix of money market and debt instruments. This fund has surpassed benchmark return consistently. ICICI Prudential Liquid Fund is next in the list of best debt mutual fund. This fund invest 80% of money in the money market securities. The balance would be invested in high quality debt instruments. It is low risk fund recommended for conservative investors. The first sectorial fund for investment is Tata Digital India Fund. It is a relatively new fund but has given magnificent returns during last one year. The objective of this fund is to invest 80% of the fund in equity related instrument of the companies in the Information technology sector. This fund has consistently outperformed its benchmark S&P BSE IT since its launch. ICICI Prudential Technology Fund is one of the oldest technology sector fund available in the market. The objective of the fund is to invest in the equity and equity-related securities of technology and technology dependent companies. A large share of the AUM will be invested in the stocks under the Benchmark Index. This fund has historically given consistent two digit returns to investors. Note – Returns are Annualized return as on 20th Nov,2018. You should be clear about your investment objective. Your investment objective should be matched with fund. Do not diversify your mutual fund portfolio blindly. Invest in few mutual funds based on your goal. It is not necessary to invest in each category mutual funds to build your portfolio. Follow SIP route for investment rather than doing lump sum investment. Invest in mutual funds for the long-term at least 3 years or above. If you are a risk adverse investor you can start building your portfolio by investing in debt or balance funds. At the last let me clarify that best mutual fund does not mean best in terms of returns, but one which suits your risk profile and investment objective and one that is best in category. You might have already invested in mutual funds. If you don’t find your funds in above best mutual fund list don’t panic. Remember that there are thousand numbers of mutual funds scheme and risk profile, investment objectives and selection terminology employed by every individual is different. Be patient, calm and stay invested in the mutual fund invested by you. Monitor performance and make changes time to time. I found your article good and unbiased. I will be grateful if you can advice me in the following…. I invested about 1 lakh each in Tata India Consumer fund , L&T Emerging business fund, L&T Infrastructure fund,and Motilal Oswal Multicap 35 fund in Jan 2018. Now after one year all the four funds gave considerably negative return. Shall I switch my investment now to some other funds or wait for some time?? Request you to wait for 6 months and if funds are not performing you can switch to other performing funds. Investing in a mutual fund house above Rs 10 Lakhs attracts notice from income tax. To avoid notice can one mention the whole amount received from a mutual fund redemption, as an exempt income in the return? Or is there any other way to avoid income tax notice when the investment amounts are legally earned? Please clarify how to avoid notices by investing above Rs 10 lakhs in a fund house. Such notices bring tensions. If amount is earned legally, you should not bother about income tax notice. Unfortunately, there is no way to stop/avoid this notice. You should file your income tax returns and keep relevant proof that money earned is legal.